Nott ingham has been ranked third in a list of the UK’s most entrepreneurial cities according to a new study from global office broking service Instant Offices. Analysis of vast amounts of Companies House data and comparisons of population estimates with business growth helped determine an ‘Entrepreneurial Index’. While Brighton and Manchester held the first two spots, Nottingham was placed third ahead of cities including London, Birmingham, Leeds and Edinburgh. With its prime central location offering excellent connections to all parts of the UK; first-class international airport; a thriving business community and prominent global brands such as Boots and Speedo calling it home, perhaps it is no surprise that Nottingham has been recognised as a key business hub. Nottingham University Business School has long been at the forefront of entrepreneurialism and business innovation through its Haydn Green Institute for Innovation and Entrepreneurship. Its mission is to be a centre of excellence in the development of enterprise and entrepreneurial skills, innovation and understanding the commercialisation of research. The Institute encourages innovation and growth regionally and nationally and has developed specific MBA and Masters degree programmes in entrepreneurship. Through its Ingenuity Lab based at the University of Nottingham Innovation Park, it has created an environment where students and alumni of the University can explore ideas and start their own enterprises. The Lab has supported the incubation of hundreds of new and early stage start-up companies and runs the UK’s largest entrepreneurship competition. Aaron Dicks is founder of Impression a digital marketing agency based in the heart of Nottingham’s Creative Quarter. In 2013 he took part in ‘Growth 100’ an initiative delivered by the University to help small companies from across the city develop the skills and knowledge needed to grow their businesses. Impression now employs over 30 staff and is looking to expand further. “These business owners all chose Nottingham, some hailing from the region and others making the move here from other parts of the country, attracted by the inward investment and growth opportunities. “Being in Nottingham has been a huge factor in our very fast growth. From the early days, we were able to take advantage of various financial schemes intended to help businesses like ours find their feet, including technology grants to equip our staff with the very best tools. Opportunities to learn through schemes like the Growth 100 programme at the University of Nottingham helping me develop as a manager. “We’ve been able to work with some really supportive people too, including the local councils, universities and organisations, which has helped us build our brand and grow our client base. Lower first-time house prices is another reason Nottingham is likely to continue and strengthen its position as a leading entrepreneurial city. New research by Post Office Money shows that Nottingham is one of the most affordable places for first-time buyers making it more appealing to graduates and those looking for work in comparison to cities like London. 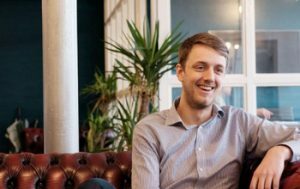 Nottingham entrepreneurs believe recruitment is easier than ever thanks to lower property prices and could even attract people away from the capital to work here. Aaron Dicks said: “Choosing Nottingham as the base for my agency was easy. Having studied in Leeds, I’d seen how inward investment was driving the city’s growth, and similar things are happening here in Nottingham. I believe Nottingham to be on a similar trajectory to Leeds; we are already seeing the fruits of our decision in the fast growth of our business. “House prices certainly have an effect. Especially in the digital industry, places like London, Leeds and Manchester are well known and it’s easy to see how graduates and those looking for a digital career might choose to go to those cities. But with prices here in Nottingham well below those of the like of London, not just for house prices but for general living expenses, we’re seeing more recruits moving into the area, making for a bigger and better talent pool. “We’ve recently recruited a team member from Leeds, who cited house prices amongst his reasons for choosing Nottingham.